Slightly early this week because of travel to TNA's taping Glasgow, but it's time for #FiveQuestionsWith. This time around we speak to former WWE and TNA wrestler Zach Gowen! Promotions Competed For: Juggalo Championship Wrestling, AAW: Professional Wrestling Redefined, Xtreme Intense Championship Wrestling, Independent Wrestling Revolution, All Japan Pro Wrestling, IWA Mid-South, World Wrestling Entertainment, National Wrestling Alliance, Collective League of Adrenaline Strength and Honor, Insane Wrestling Federation, amongst others. 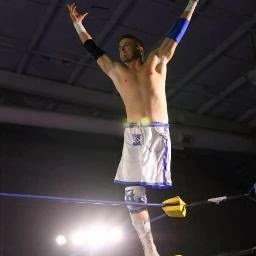 Championships and Accomplishments: MAW Tag Team Champion (with Silas Young), CURRENT CLASH Tag Team Champion (with Greg Iron), 2 Time and CURRENT PRIME Tag Team Champion (with Greg Iron), CAPW Junior Heavyweight Champion, AAW Tag Team Champion (with Krotch), IWR King of the Indies Champion, IWR Tag Team Champion (with Kamikaze), 3XW Heavyweight Champion, XICW Light Heavyweight Champion. 1. How did you get into wrestling and what was it that drew you to the sport? I used wrestling as a much needed escape from a not so great childhood. The pain of my dad taking off at 4 years old, the pain of losing my leg to cancer at 8, the pain of never really feeling like I fit in anywhere....all of that disappeared when I got lost in the wonderful world of wrestling. 2. How did your disability effect your approach to wrestling and how do your opponents differ their approach when putting together a match with you for the first time? A lot of people ask me, "Is it hard to wrestle with only 1 leg?". Here's the thing: I've never wrestled with 2 legs so I don't know how much harder it is on 1 leg. Hell, it might even be easier! I do know I'm very blessed and a lot of the planets had to align for me to do what I do in terms of my athleticism, balance, body type, etc. I feel like guys might get nervous wrestling me for the first time simply because it's something brand new for them and out of the ordinary. It's human nature for fear to develop there. But that goes away every time within the first minute of a match. I take great pride in my work and my ability to work with anyone in the industry. 3. During your 2003-04 run in WWE, you worked with some of the biggest names in the Industry over a relatively short period of time, what did that feel like at the time and how do you think that molded you into the performer you are today? It was an amazing, surreal experience. I wasn't equipped mentally or emotionally or spiritually to appreciate and receive that gift at the time. It's taken a number of years in growth and maturity to truly appreciate what was handed to me. But I also think that run hindered me in some aspects. Fans and promoters alike have this perception or idea of what kind of performer I am based off of what I did on TV over 10 years ago as a kid. I feel like I've grown immensely as a performer and have matured to an appropriate level to handle the responsibility that my story brings to the table. I'm grateful for all of the opportunities to share that, this interview included. 4. What are you top three matches of all time and why? Top Three Matches of All Time?? This may be a weird list because I have certain emotional attachments to them but I think that's where the magic of pro wrestling lives... in it's ability to make you feel a certain way. i. Ric Flair vs Lex Luger Great American Bash '88. Flair at his best, Luger at his best, Jim Ross at his best....wish the finish came out a little better but I can't even be mad about it because the rest was so good. ii. Rey Mysterio vs Sabu One Night Stand '05 was it? Sabu and Rey are my wrestling idols so it was a dream match for me. And I knew how much it meant to Rey. When they told Rey he was wrestling Sabu, he broke down in tears because he was so happy. So to see these 2 guys tear it up the way they did brought a huge smile to my face. iii. Necro Butcher vs Samoa Joe ECW Arena 2005 IWA Mid-South. That match is just surreal, everything from the action to the atmosphere to the commentary.... that was a moment. Wrestling is all about creating these moments. That was special. 5. Where can our readers catch you in action next and will you be making your way "across the pond" anytime soon? Not sure when this will come out but there's a ton of exciting projects in the very near future. I have a DVD documenting my story coming out before Wrestlemania, I feel like it's going to be special. We were talking about moments in wrestling and what kind of emotional, positive impact they can have on an individual. A 16 year old kid afflicted with Cerebral Palsy saw me on TV and was inspired to follow his dreams of becoming a professional wrestler. 10 years later, Gregory Iron is not only one of the best wrestlers in the world but I'm proud to call him my tag team partner. As "The Handicapped Heroes", we had an amazing 2013 but 2014 looks even better with some of the opportunities lined up in and outside of the ring. And I have Greg to thank for re-igniting my passion and love of wrestling. As far as getting to the UK, it would be monumental. I've never wrestled there. I think my biggest strength is my ability as a live performer and if you put me in front of an audience that has never seen me live, the possibility of creating some magic is there. I met Mark Andrews and Pete Dunne over the summer while they were touring in the States. Incredibly talented guys and it's inspiring to see them put in the work that's necessary if you want to make a career out of this. I'd love to come across the pond and hook up with those guys again, lots of positive vibes.